Harriet (Harry) Walker is gutsy, tenacious and focussed. If you asked Harriet about herself, she’d tell you she’s a cop. Not interested in analysis, or deep soul searching, Harry defines herself by what she does. Dedicated and driven, she has not yet confronted the question of who she really is, or what she really wants from life. Harry has a strong drive to prove herself, not believing she is good enough, no matter what anyone tells her…or what she achieves. She knows that whatever the Police PR might say, she’s a woman in a man’s world. But that doesn’t faze her. Her husband’s death shakes her confidence and she questions her former easy trust in the people around her. Who is corrupt and who is not, whom she can rely on and whom she can’t are things she still has to learn. Although Harriet is initially suspicious of Joe Hill, her hostility turns to respect and respect to friendship. She knows if she’s going to trust anyone, it’ll be her new partner. Freya graduated from NIDA in 2000. 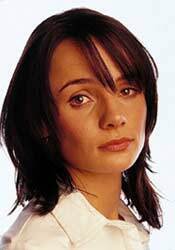 After a number of stage productions she made her television debut in 2001 in the ABC series HEAD START. Freya plays detective senior constable Harriet Walker in WHITE COLLAR BLUE.